An accelerated rhythm of life has turned stress into one of the evils of your time. Thanks to ingredients found in food easily available, there are alternatives to control stress. Chores have built up and the hours in a day aren’t enough to finish everything, leading us to a state of tension that can cause illnesses. Stress exhausts our energy reserves and weakens our defenses. Increasing the amount of cortisol in our brains harms our neurons; in Nazis concentration camps, many people less than 40 years old were found to have Alzheimer’s disease. Stress increases the internal production of cholesterol in our body, which can lead to cardiovascular disease, one of the leading causes of death in this country. Scientific studies demonstrate that people in stressful situations, such as a difficult job, a divorce or a sick relative, have low levels of vitamin B in their blood. Vitamin B is responsible for controlling nervous system impulses and a deficiency can lead to numerous problems: irritability, depression, insomnia, headaches or inability to concentrate. Food we eat affects our ability to handle stress. Some of the foods that stimulate proper functioning of our cells are the following: bananas, almonds, wheat germ, brewer’s yeast, broccoli and sunflower seeds. Consuming foods rich in vitamin B is indispensable for our health and relaxing our nervous system. VITAMIN B1: kelp, spinach, corn, walnuts, cherries, brewer’s yeast. A deficiency causes: fatigue, depression and gastrointestinal problems. VITAMIN B2: milk, eggs, avocado, dark leafy vegetables and seeds. A deficiency causes: irritated eyes, anemia, dermatitis, cold sores. 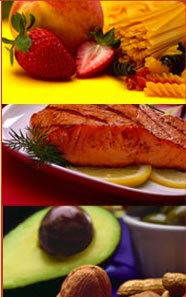 VITAMIN B3: red meat, chicken, eggs, salmon, calms, eel, avocado. A deficiency causes: cardiovascular disorders, weakness and infections. VITAMIN B6: fish, bananas, tomatoes, walnuts, green vegetables, red meat and chicken. A deficiency causes: anemia, nervous disorders and weakness. VITAMIN B12: egg yolks, crabs, sardines, salmon, red meat and kidneys. A deficiency causes: slow growth, anemia, tiredness and nervousness. It is recommended to avoid consuming coffee, sodas, alcohol and canned foods, as well as avoiding contraceptives that reduce vitamin B levels in the body. Consume herbal tea daily to help relax. Lime flower tea or mate have been used by Native Indians to avoid disputes and creative a friendly environment; chamomile is considered one of the most relaxing teas and it helps prevent head aches and muscle spasms.